Episode 2: Perils of Probing: What's Inside That Scope Probe? Did you know scope probes are not just wires? In this 8 minute video Jack explains the real issues behind scope and logic analyzer probes, and why using one without understanding the issues can cause your embedded system to fail. Firmware people take note! Today, I'm going to be talking about the real behavior of scope probes,which may be surprising, and why firmware people have to have some understanding of this. That's right, people doing the software inside embedded systems really need to have some sense of what's going on in high speed digital systems. I'll be teaching some electronics. 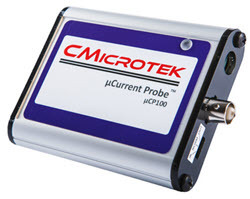 We think of a scope probe or a logic analyzer probe as being a wire. What could be simpler than a wire? They're not. They're complicated circuits. They have capacitance, inductance, resistance. And these all combine in various ways to create different levels of impedance. So here's the math. This is all there's going to be. We're all familiar with Ohm's law: E, for voltage, E equals IR. What could be simpler? There's something called reactance. Capacitors and inductors have this quality known as reactance. And this is a formula for the reactance of a capacitor. It doesn't matter that you understand the formula. The important thing is to note is that in the divisor, there's frequency as well as capacitance factored in. In other words, reactance varies depending upon the frequency applied to the capacitor. Reactance is measured in ohms. It's just like a resistor, except it has this frequency component. The formula for an inductor is similar, but not quite identical. This next formula is sort of complicated-looking. Don't worry about it. The point of this is, it shows that we can combine resistance, pure resistance, and reactance to form something called impedance, which I've been talking about. Impedance too is measured in ohms: except since reactance is involved, and since reactance varies with frequency, impedance too is a function of frequency. And finally, we can derive a new form of Ohm's law: I equals E over Z, over impedance. It's just like the original form of Ohm's law, except now the current flow is a function of impedance, which is a function of frequency. So the current flow will vary depending upon the frequency. When you buy a scope probe, you look at the probe, it probably says something like 10,000,000 ohms on it. That's a pretty high impedance. Matter of fact, it's so high that putting a 10,000,000 probe on any node isn't going to cause any problems at all. The problem is that rating is a lie! It's not really true. Look at this graph. This shows the impedance of a scope probe as a function of frequency. So on the vertical axis we see Ohms, the impedance, and frequency across the horizontal axis. There's three curves shown: a curve for a scope probe with 5 picofarads of capacitance, one with 10 picofarads, and one with 50 picofarads. Because capacitance is a domineering effect in scope probes. And as you can see at DC, yeah right, 10 megohms, it's great, but none of us measure DC. As you go to higher frequencies that resistance, that impedance, goes down. At 100 megahertz, with a 50 picofarad probe, you're talking about a handful of ohms. Putting that probe on a node, on any node, is going to cause the system to crash. Tektronix is one of the few companies that does a great job of characterizing the impedance of their probes. And here's a graph from one of their data sheets for their TPP1000 probe. It's a 4 picofarad probe. And as you can see, sure enough, as the frequency goes up, the impedance goes down drastically. This is a $1,000 probe. We're not talking about some sort of a Walmart probe. Here's another typical probe. This one is 10 picofarads. Very common to find 10 picofarad probes in our labs. This is about a $300 probe. I mean, it's still not something that you're going to get at Radio Shack. And indeed, as we can see from this graph that at 100 megahertz, which is not very fast by today's standards, it has an impedance of 159 ohms. It's like putting a 159 ohm resistor across your nodes. We derived a new form of Ohm's law where we can get current as a function of impedance, and here is an excerpt from a TI data sheet for a typical logic gate that we would use in a modern system. And in yellow, the data sheet shows us how much current that gate can drive as a function of the power supply voltage. In red is how much the probe needs. In other words, if you're driving this gate with a fairly high voltage, it can put out 9 milliamps. But the probe, just the probe alone, needs 14 milliamps. And what that means of course is you probe that node, the gate stops being able to drive the rest of your logic, and the system crashes and dies. So what do we do? You can buy what's called an active probe, which typically has less than 1 picofarad of capacitance. They're fabulous devices, but they're going to run you about $5,000 each. As a matter of fact, not long ago, Agilent came out with a 30 gigahertz oscilloscope, and I called them up. I said, "Wow, this is cool, but what do you do for probes?" They said "Oh, no problem, we've got a solution. You can buy probes from us. They're $29,000 each." You know, four of those are gonna buy you a house in the Midwest. There are some alternatives. Here's a probe we can make. You take a meter of co-ax, you solder a 1K quarter watt resistor to the end of it, and now suddenly we have a 0.5 picofarad probe. And here, I'm showing how I've soldered the resistor to a node I want to probe on a board. You'll see the ground wire is also soldered fairly close to the node. The trick here though, is that your scope has to have a 50 ohm impedance. Most modern scopes will let you set that. It's a controllable setting. If you have an older scope, then you can get this little adapter from Digi-Key for about $50, which'll do the same thing. But the bottom line is that suddenly you have a probe with this characteristic. At 100 megahertz, instead of 159 ohms, we're talking 3,200 ohms. It's a heck of a probe for about $2 worth of parts. It's not as convenient as a probe that you can just clip on here or clip on there, but it's cost-effective and attractive. As I mentioned it's not just scope probes, it's any probe you're using to get data out of your system. I mean, here's an example of a nice little USB logic analyzer with all of these probes. And these nice little grabbers. and look at the specs. These often have 10 to 15 picofarads of capacitance. They can cause all of the problems that we've been talking about today. Finally there's two types of general probes. There's a times 1 probe, which means whatever voltage you're measuring is the voltage shown on the scope. There's also a times 10 probe, which means the scope shows a level one-tenth of what's actually being probed. Most scopes today will automatically adjust the scale, so you don't even really see this half the time. However, the times 1 probes are awful! They typically have 30, 40, 50, I've even seen them with 100 picofarads of capacitance. If you have any times 1 probes in your lab, gather them all up and donate them to Goodwill. They have no place in a modern, digital lab. So today, we've seen how scope probes can actually alter the signal on the node that you're measuring, and can cause the system to either crash...or perhaps lie to you about what the signal really looks like out there. And we've talked about using terminations in order to correct that.